E-Z Tree™ is an easy and convenient way to purchase trees at a discount. Celebrate Memorials, B'nai Mitzvah, Weddings, Birthdays, New Baby, Get Well, Thank You, Holiday greetings and more with this living tribute to your friends or loved ones. You simply purchase a "bank of trees" to be used as needed. 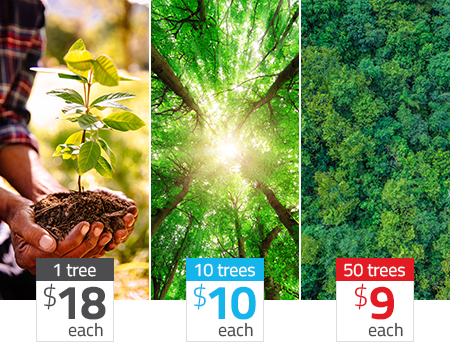 E-Z Tree™ accounts are established and replenished with 10 trees at $10 each, a 44% savings over the regular tree price of $18. Your cost is $100, a savings of $80! A beautiful certificate of your choice is mailed to the recipient with your personal message. Use your account to purchase any of JNF’s tree or water certificates.